This is in memorium to an incredible dog. We rescued him at the age of 1 1/2 years -- a wild, hyper, totally untrained dog full of love. He broke my leg (knocking me down) the first week we had him. However socialization progressed with him on a leash next to me with leg propped up on the couch. My husband had raised and showed Great Danes for years, but never owned or really even spent any time with a Shepherd. I had previously owned (and showed minimally German Shepherds in obedience and have always loved the breed). We lost our great guy in December after many wonderful years. We have just purchased a new GSD puppy to love who will be ready to come home the first week of February. Thanks for considering our great boy. Thanks for your wonderful site. Let me say right up front to Judith, Duke’s mom, that I am so very sorry for your loss of your German Shepherd Dog, Duke. I know that he is missed. 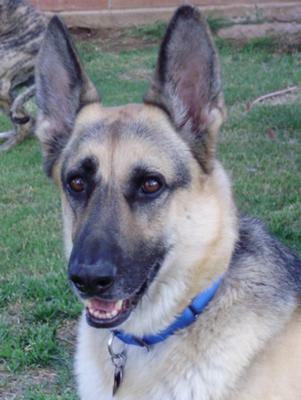 Again, thank you for sharing your story about your German Shepherd Dog, Duke, here with us all at Total German Shepherd. We all grieve along with you in your time of loss.